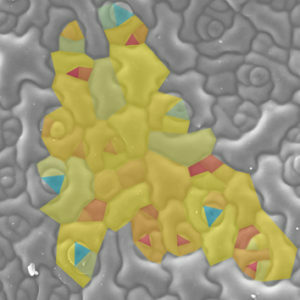 The epidermis of an expanding dicot leaf is a mosaic of cells differing in identity, size and differentiation stage. Elsner et al. study leaves of Arabidopsis thaliana wild-type and triple cyclinD3 mutants and find that relative growth rates of individual epidermal cells or small cell groups differ several fold from those of adjacent cells, and change in time. Growth within an individual cell is also heterogeneous, and this spatial and temporal variation is not related to the size of either the cell or the nucleus. The results support the hypothesis that growth heterogeneity of leaf epidermis is not dependent on cell cycle regulation per se. commitment. Before or while exchanging or giving communicate in clear terms about the purpose and the promise that you are making. About The Author of Fat Burning Furnace, Rob Poulos. You can do these floor exercises to burn fat almost anywhere - no gym needed. rate, although these numbers can vary from person to person. shape due to factors such as:. Second, you're going to have to use photo retouching on different areas of the image to repair and blemishes or goods that would distract inside image. Intermittent administration (taking Accutane only one week per month) seems to work less well, producing insufficient most current listings for more than half in the patients studied. If goods are drying out your skin layer your oil production can increase while your epidermis tries to create balance. Wash gently to prevent damage for your acne employing a soap with benzoyl peroxide or salicylic acid, which will help fight bacteria and pimples. A fat bocker pill restricts the body from absorbing fat during digestion. The cells of your body are attacked by millions of free radicals every day. Try starting a resistance routine using exercise bands or really light weights. of pearl which might be normally flat around the back and somewhat thicker. will look very high quality and expensive. one should keep in mind before emptying their pockets on something so precious'. There is general agreement that a major leap forward in the history of friendship rings occurred in late seventeenth and early eighteenth century Ireland in the Galway Bay area of Western Ireland, and in particular around Claddagh and nearby fishing villages. It is typically helpful to set your video camera in stain focus mode.